Out of more than 19,000 public high schools in the nation, Arcadia High School ranks in the top 1 percent of the best public high schools in America. According to Niche.com’s 2019 list for Best Public High Schools, Arcadia High School not only receives this national honor but is also in the top 1 percent of best public high schools in the state of California and in the Los Angeles area. Scoring an overall A+ Niche grade, Arcadia High has also secured top placement in numerous other Niche categories at the local, state, and national levels. In addition to its stellar Niche numbers, Arcadia High has been named a U.S. News and World Report Gold Medal School three times. This is an honor bestowed on less than 3 percent of the more than 19,000 schools in the country. Similarly, the College Board placed Arcadia Unified School District on its prestigious annual AP® District Honor Roll for two consecutive years (2017 and 2018) in recognition of its continued, impressive offering of Advanced Placement and Honors curriculum. Arcadia High’s Class of 2018 had a 100 percent graduation rate, with numerous grads starting at Princeton, Yale, MIT, Stanford, Columbia, and other prestigious Ivy League schools this fall. While Arcadia High alums are thriving in top universities across the nation, academics is just one factor leading to the high school’s elevated ranking. Arcadia High Girls Tennis won back-to-back CIF championship titles in Doubles in the 2016-17 and 2017-18 school years. The Apache Badminton team also saw a CIF championship title in Boys Doubles last season. 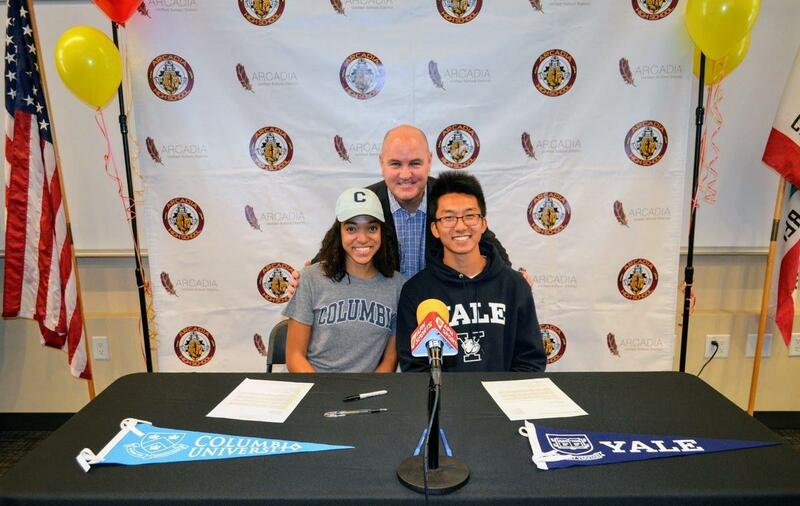 Additionally, two Arcadia High track student-athletes from the Class of 2018 were invited to join the Columbia and Yale University track and field teams. The home of the Apaches also has a unique offering of more than 60 academic teams and clubs for its students. These highly successful clubs include the Future Business Leaders of America, Academic Decathlon, History Bowl, Math Team, Ocean Science Bowl, Quiz Bowl, Physics Team, Science Bowl, Science Olympiad, Government Team, Robotics Team, and Speech and Debate, to name a few. Students also have numerous Career and Technical Education pathways for sports medicine, computer science and programming, engineering, graphic design, dance, and more. Likewise, the district boasts internship opportunities for students, one of which is the award-winning AUSD Digital Communications Internship, which has also been recognized by the City of Arcadia for its exemplary work in the fields of public relations and communications.